It's cold out there!! With the Northwest's recent blast of extended freezing weather, I've been craving something tropical to temporarily transport me to a warm locale. 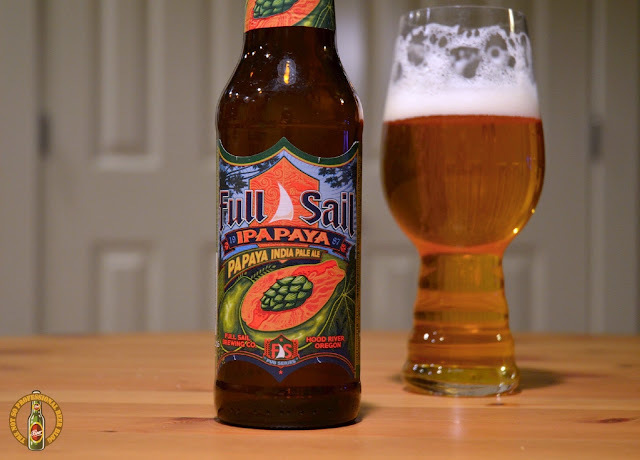 Full Sail has come to the rescue with its release of IPApaya, a papaya IPA. I'll be the first to admit that I'm not a fan of the papaya. For some reason, the smell of papaya (especially ripe) reminds me of, well—vomit. As you might expect, this is not a flavor descriptor one typically seeks as they peruse the beer aisle. Undaunted, I picked up a single bottle at the grocery store and decided to roll the dice. IPApaya is part of Full Sail's Pub Series and will be available January - April. For more details, check out the brewery's press release below. blue cheese or a nicely aged triple-creme brie. the Full Sail Trophy Case and on draft. 6.2% ABV, 58 IBUs. From our pub to your place – cheers! balanced and ridiculously tasty beers. Learn more at www.fullsailbrewing.com.